It's a Thanksgiving tradition we never miss here at Casa TalkLeft. Radio stations around the country today will play the 18 minute version of Arlo Guthrie's Alice's Restaurant, recorded in 1967. Should you miss it on your local radio station and yearn for the original version, you can listen to the You Tube version above. Why listen to Arlo's 18 minute version of Alice's Restaurant? Because it's like our liberal national anthem, that only comes around once day a year, so you don't want to miss it as it's coming around. If you're wondering where Alice is, she's here. 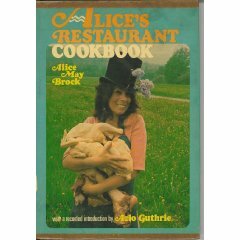 Does anyone besides me still have a hardcover edition of her 1969 Alice's Restaurant cookbook in their kitchen? (Photo here.) It's filled with tasty recipes and very easy instructions. 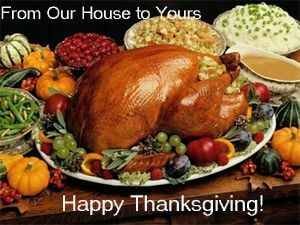 TalkLeft wishes you all a Happy Thanksgiving. Don't forget to check in with your local radio station to find out what time they will play Alice's Restaurant. It was November 28, 1965 that Arlo was convicted of littering in Stockbridge, MA. You can read the backstory here. I will be busy setting up my new Desktop computer. I spent 8 hours Sunday reading up on every feature of every Dell and HP, I ended up with a great deal on a very powerful Dell. Of course, now comes the agony of transferring stuff over and hoping it works. I used a program last time and it caused a lot of problems, so this year I will do it by hand. My 2 GB hard drive is filled on the old one, and windows installer hasn't worked in year and a half --which means I haven't been able to add or remove any programs. Black Friday is definitely the day to do swap it out. I'll be back to normal schedule next week, my last day of an 8 day court run was today. 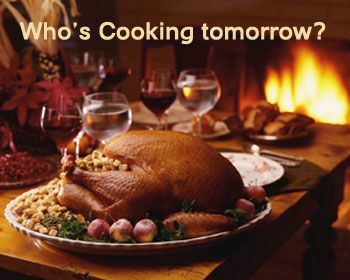 I'm cooking Thanksgiving dinner tomorrow, for the first time in years. I'm about to start. Is anyone else here cooking? What are you making? 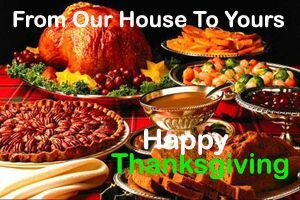 I'm making a cornbread and fruit stuffing, two kinds of mashed potatoes ( regular and sweet), a green bean casserole, gravy, cranberry sauce and salad. In addition, of course, to the turkey. 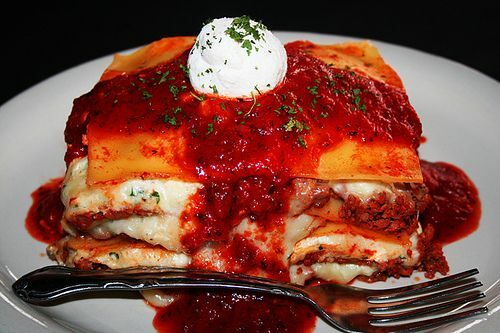 I also made a giant lasagne last night, and put it in the freezer, just in case the turkey doesn't come out right. I'm much better at cooking one pot meals: sauces, noodle dishes and stews, than one big bird and a lot of side dishes. I'm also checking out Black Friday deals. Be careful about clicking from Google, there are tons of links with m*lwAre. Who do you think has the best deals on whatever you are looking for? Of all the Thanksgiving Day traditions, my favorite is still the one that comes at noon, when KBCO in Boulder (and other stations around the country) play the 23 minute version of Arlo Guthrie singing "Alice's Restaurant" in 1967. While everyone else is cooking turkey, the TL kid and I are eating bacon and eggs and listening with the sound turned up loud, smiling as if it's the first time we've ever heard it. If your local station isn't playing it, you can stream it live (noon MT) here. Or, you can pick your own time and listen, courtesy of KDKP in Arizona. But you'll miss that special feeling that comes with knowing thousands of others around the country are listening at the same time and sharing the tradition. How to describe it? It's like our nation has a liberal anthem, but only for one day each year, so you don't want to miss it when it comes around. KBCO in Boulder is playing Arlo Guthrie's Alice's Restaurant at noon and 6pm, MT. You can listen live here. It was November 28, 1965 that Arlo was convicted of littering in Stockbridge, MA. You can read the backstory here. Just a little something to tide you over till tomorrow when radio stations around the country will play the full 18:37 second version of Arlo Guthrie's Alice's Restaurant. It's a great Thanksgiving tradition. Radio stations around the country today will play the 18 minute version of Arlo Guthrie's Alice's Restaurant, recorded in 1967. If you're wondering where Alice is, she's here. Does anyone besides me still have a hardcover edition of her 1969 Alice's Restaurant cookbook in their kitchen? (Photo here.) It's filled with tasty recipes and very easy instructions.